The rifle is a 16″ Vepr in .308, set up with 20rd magazines, 1-5x scope and Magpul MOE stock on ITT hydraulic recoil buffer. Felt recoil is below that of .223, which makes it an excellent plaything for a teenage girl. Reduced recoil is welcome for all shooters, not just for girls. 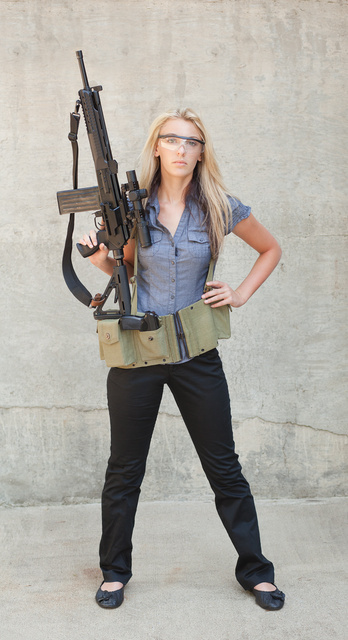 This young lady’s eclectic outfit happens to include eight full 20rd magazines for the .308 and a Makarov — quite a load besides the rifle. She showed no sign of even noticing the weight. Not bad for 15. If anybody recognizes the scope, I’d like to know the brand. The only markings on it were “Made in Japan”. This entry was posted in interesting people, pistol, rifle, weapon and tagged 308, AK, blue, girl, optic, scope, shiort, teenager, Vepr. Bookmark the permalink. What is the ammo belt? I’ve got .308 mags, but almost everything on the market it geared for .223. Israeli FAL/L1A1 mag carrier, 1970s. Does the VEPR have the wandering zero problem of most AK platform’s? I’ve only extensively used one of them but didn’t run into any problems. Not even sure about wondering zero with AKs — I’ve owned a few and they seemed to stay zeroed. Quick question: How much louder is a 16″ vs. 20″ .308? I’m trying to decide which length to buy in an FAL. 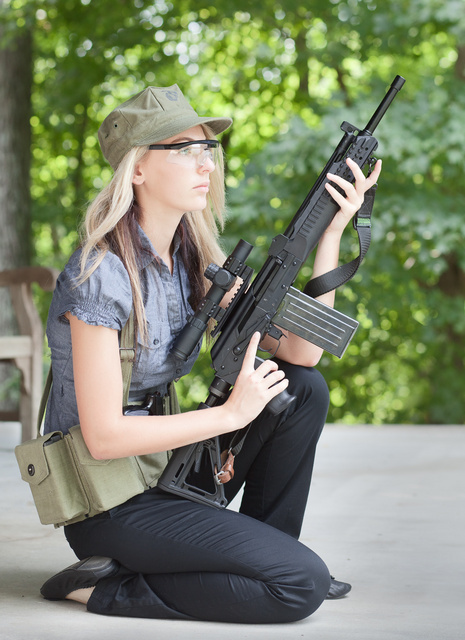 I went with 20″ Vepr for myself and really prefer minimum of 18″ for .308, 20″ being better. I think you’d not like the amount of muzzle blast from the 16″. Good to know. Maybe I’ll do 18″, but 20 seems like a better idea. Can’t be much less handy, it’s only 2 to 4 inches difference. Just guessing here, but the scope may be a Weaver tactical, model 800364. A little spendy, for me anyway. Almost certainly the Weaver 1-5×24.